Decorated actor, producer, director, politician, philanthropist and entrepreneur, Lord Richard Attenborough left an unforgettable legacy to remember him by. Best known by international audiences for the two Academy Awards he received for 1983’s Ghandi, or his portrayals of Dr. John Hammond in Jurassic Park and Kris Kringle in Miracle on 34th Street, Lord Attenborough was also heavily involved with the Chelsea Football Club, the British Academy of Film and Television Arts (BAFTA) and in 2004, served as founder of the Jane Holland Creative Centre for Learning at Waterford Kamhlaba. Nearly two years after his passing in August of 2014, Lord Attenborough’s retreat in the French Riviera is now listed with Côte d’Azur Sotheby’s International Realty. “Lord Attenborough, who acquired the plot in the 1980s, revamped the main house to include four bedrooms, three bathrooms and an open-plan living room,” said Homes & Property in their recent piece covering the momentous property. Located in the picturesque provencal village of Châteauneuf-Grasse, which dates back to the 12th century and is home to just over 3,000, this historic home is located approximately 25 kilometers from Cannes and 35 from Nice. The estate comprises approximately 10 acres of gently sloped grounds offering magnificent, uninterrupted views of the Mediterranean and the surrounding countryside, and features a swimming pool, covered patio, and hundreds of century-old olive trees. Approximately 2,500-square-feet, the main house includes six bedrooms, three bathrooms, a huge open-space living room, a magnificent study/drawing room with exposed wood-beamed ceiling, and an airy dining room with a wood-burning fireplace. The asking price for the estate is 2.500.000 € EUR and includes furniture and other select belongings of the late Lord Attenborough. The post Luxury Living | Lord Richard Attenborough’s French Riviera Retreat appeared first on Sotheby’s International Realty | Blog. 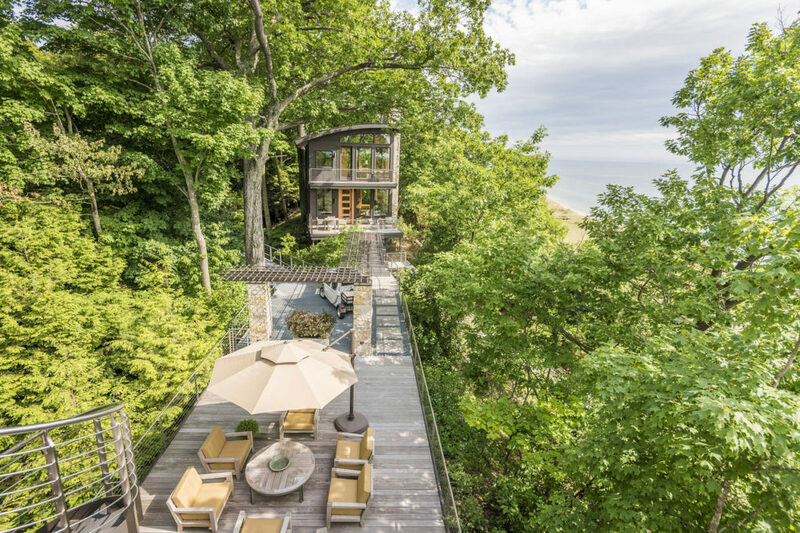 The deck of Gaylen Byker’s Lake Michigan home isn’t just big. Measuring about 6,000 square feet, it’s got its own traffic lane. The Brazilian ipe wood decks are perched on a dune overlooking the lake and include an outdoor kitchen, a resistance-swimming pool, spa, fireplace and lounge areas. The traffic lane is actually an adjoining steel deck, which is used by an electric cart to shuttle visitors across a ¼-mile bridge at the base of the property. “It feels like you’re on a ship,” says Mr. Byker, 68, a retired natural-gas executive and former president of Calvin College in Grand Rapids, Mich. He considers the deck a selling point of his 8,114-square-foot modernist home in Montague, Mich. He and his wife Susan, 67, are now listing the home for $10 million, saying they want a smaller home. The backyard deck is having its moment in the sun. The size of decks and patios is rising, and architects are seeing renewed interest from luxury-home buyers—even in cold-winter markets. The shift, experts say, reflects what’s happening indoors: Walls are coming down, along with the notion of boxy, formal living spaces. Now, more developers are taking cues from the resort industry, where the outdoors shines. There is roughly 6,000 square feet of Brazilian ipe wood decking on the Lake Michigan home of Gaylen and Susan Byker. Builders are leading the charge in waterfront Malibu, Calif., where outdoor living is the rule. Developer Crown Pointe Estates is selling a 13,814-square-foot contemporary home with another 10,000 square feet of decking and patios for $22.9 million. The home, which was designed by Burdge & Associates, opens to an infinity-edge pool flanked by two heated cabanas with TVs. A separate deck off the upstairs master-bedroom suite has a six-hole putting green. Down the hall, the gym opens to an outdoor yoga and massage room. “If you don’t add that outdoor playground, you’re just getting it wrong,” says Scott Morris,the company’s director of sales. The home, completed in February, will be sold fully furnished. Now the trend is moving east. Pennsylvania-based Toll Brothers, one of the nation’s largest luxury-home builders, decided in June to begin offering options for decks and patios in all 19 states where they build, including Colorado, Washington and Minnesota. Previously the company offered outdoor rooms in fewer than half of those states. Tim Gehman, director of design at Toll Architecture, says the company is responding to demand, as homeowners get savvy about new glass walls and finely woven screens that extend the use of outdoor spaces despite inclement weather. In a national survey of more than 500 residential-architecture firms in the first quarter of 2016, the American Institute of Architects found that 69% of firms saw increased demand for outdoor living space, which is the second-highest response since the question was first asked in 2005. “It seems to be coming back stronger than in the boom,” says Kermit Baker, the AIA’s chief economist, who attributes the growth to a cultural shift away from formal living spaces. At the same time, the size of outdoor spaces is growing. Last year, the average size of decks on luxury homes was up across all regions of the country compared with 2014, according to a 1,300-builder survey by Home Innovation Research Labs, an independent subsidiary of the National Association of Home Builders. The sharpest growth was in the Northeast, where the average deck measured 406 square feet, up 53% from 2014. Adapting that California dream can take some tweaking in colder markets. “I call it ‘mountain lanai,’ ” says Bob Bowden, an Aspen-based real-estate agent and developer describing a Hawaiian-inspired, 13,068-square-foot contemporary home he built in 2009 with more than 9,000 square feet of outdoor-living space. Chilly nights on the deck are offset by fire pits and heated floors. “It was a gamble,” Mr. Bowden says, because the expansive covered decks were new for the market, and building up the outdoors meant sacrificing valuable interior square footage. The home sold for $24.5 million in 2010, near the asking price of $26 million. Now he is selling a neighboring 14,000-square-foot home for $36 million, banking on outdoor features like a heated pool with a snowmelt deck and a covered commercial-grade kitchen. Infrared heating fixtures are buried in the lighting throughout the space. In Montague, Mr. Byker’s expansive decking is central to the home. The 40-acre property’s steep slope and irregular shape make for expansive lake views, but difficult construction. The wood decks were devised to connect three detached sections of the home, each with its own outdoor amenities. The nine-bedroom, eight-bath limestone and copper home hews to a Japanese contemporary style, with 12-foot walls of sliding glass. Mr. Byker says the home is inspired by Japanese design, as well as contemporary homes in the Northwest. Walls of glass overlooking the lake open to the outdoor decks. The couple’s favorite “room” is the 900-foot rooftop sun deck, with chaise longues, a fireplace and large juniper plants, overlooking the lake and more than 800 feet of private shoreline. “It’s spectacular in the winter,” says Mr. Byker, who added that snowy decks aren’t a problem with a snowblower. The home was completed in 2011 for $10 million, including the cost of land—a third of which was spent outdoors, Mr. Byker says. The home was listed in May for the same price, but Mr. Byker says he never intended to turn a profit. He and his wife are considering building another home with an emphasis on the outdoors nearby. While unique features can make for impressive homes, they can also limit the buyer pool. In a recent survey of 100 markets by Remodeling magazine, upscale deck additions resulted in a positive net-gain in only two cities: Columbia, S.C., and Santa Rosa, Calif. The national average cost of a 320-square-foot deck with high-end composite materials was $37,943, but fetched a resale value of $21,877. The return on investment can vary greatly, depending on the market, said Craig Webb, the magazine’s editor in chief. In Salt Lake City, Alan Lang, 68, and his wife Charlene Palmer, 48, built a 13,717-square-foot, European-inspired home on 51 acres in 2004. The five-bedroom, seven-bath home has 4,000 square feet of decking on four levels with lake and city views—an unusual amenity for an area that gets an average 51 inches of snow annually. Mr. Lang, who owns a crane and equipment business, built the home on spec and sold it in 2005 for about $5.5 million, he says. The new owner is now renting it back to Mr. Lang, who is building a new home nearby. The home went back on the market in 2014 for $5.9 million with Linda Secrist of Berkshire Hathaway HomeServices and is still looking for a buyer. Ms. Secrist said there are no comparable homes in the area—the average luxury home is in the $3 million-range. Douglas Burdge, who designed the Malibu home, says he was commissioned to create a California-style home in sweltering Houston. The client installed air conditioning on the outdoor veranda. The post Luxury Homes Gain Over-the-Top Decks appeared first on Real Estate News and Advice – realtor.com. When considering exquisite luxury goods—paintings, sculpture, even fabrics, furniture and wine—we think of personal, highly curated items that make our living spaces distinctive and enhance the ambient experience of a particular home. In some cases, however, the home itself is the oeuvre d’art. In the art world, older isn’t always better, but revered older works do carry additional prominence, specifically the prestige of age and history that newer art hopes to acquire with time. Similarly, as beautiful homes and estates begin to acquire the patina that only decades or even centuries can bring, they take on an unmatched nobility and grandeur. There’s a certain class of buyer and homeowner—patrons, if you will—that places a premium on properties graced by time. To them, living in a historic residence is akin to living within a famous piece of art. “Owning a property that stands out as a landmark or a testimony to a glorious past is like owning a unique piece of history,” says Diletta Carutti, of Italy Sotheby’s International Realty. “Historic,” of course, means something different in each part of the world. The European sense of history stretches deep—enthusiasts shopping in Florence or Rome, for instance, will encounter residences that date to the Renaissance or Baroque, vividly reflecting the décor and ornamentation of those periods. In the U.S., it might mean a colonial-era farmhouse in New England or one of the famed “cottages” of Newport. Firestone says what buyers are truly looking for in older homes is character, and in particular preserved character—the house must innately reflect the time and conditions amid which it was conceived. Houses must have a strong street presence and great façade as well as specific period interior features: traditional floor plans with high ceilings; formal living rooms with entrance halls; double parlors with fireplaces; original trim work and molding; staircases with handcrafted balusters, banisters and original treads; and perhaps most important, original wide-plank flooring. Still, as much as owners embrace the way these homes offer glimpses into previous and more elegant eras, the archeological pride only goes so far. In fact, it typically stops at the kitchen and bathrooms. American estate homes from the 18th and 19th century prioritized entertainment—hence the ornate and spacious public areas—but the bathrooms were usually rudimentary and the kitchens, designed for staff, small. As lifestyles have evolved these outdated spaces are no longer considered historically important (or desirable, or practical), and today it’s perfectly acceptable for vintage homes to feature fully remodeled and updated “private” spaces. “You want to walk through the great history and character of the interior, the foyer, the dining rooms, the living room and hallways, and then after that buyers want to walk into a new kitchen and new bathrooms,” Firestone says. It also brings with it important maintenance and preservation responsibilities. American homes in this category often reside in historic districts with strict guidelines for improvements, often based on standards developed by the National Park Service, including what materials can be used during renovations and limitations on what can be altered. These factors not only inoculate historical residences from changing trends (something sorely lacking in the 1950’s, 60’s and 70’s) but also help uphold property values. Most European countries also have in place similar regulatory agencies to protect old and ancient structures. Preserving historic homes is not for the timid. It’s a fact of ownership that, simply due to the age of these buildings, there will be issue to be addressed and remedied. Cracked or uneven foundations due to settlement, malfunctioning doors and windows, water damage, brick deterioration and warped or slanted floors are inevitable over a lifetime of hundreds of years. Owners must have a passion for conservation. But those who undertake this level of ownership usually do appreciate and embrace it. Firestone recalls one client so determined to take his home back to its original state he had every plank of flooring removed and re-planed to repair water damage before being meticulously reinstalled. That’s not just dedication, but love. Article provided exclusively to Sotheby’s International Realty, LLC. by Derek Duncan. The post Luxury Lifestyles | Living History appeared first on Sotheby’s International Realty | Blog. Would you LIKE to BEAT the #summer HEAT in this #pool? Waking up with a view of open water is a luxury many people desire. Here are three unique luxury homes across the globe with spectacular waterfront views. From Greece to Hawaii to Massachusetts, explore these different style homes.